The FireFound add-on for the Firefox browser adds tracking and remote wipe features that can help with lost or stolen computers. Track your laptop’s location via Firefox--and set up an emergency data delete if it’s lost or stolen--with the award-winning FireFound add-on. The free utility works in conjunction with a FireFound username and password, which you choose the first time you start Firefox with the add-on installed. It uses the Firefox Location-Aware Browsing feature, which in turn relies on the Google Location Services, to guess your computer's physical location. When the location changes, FireFound sends its new location to your account. 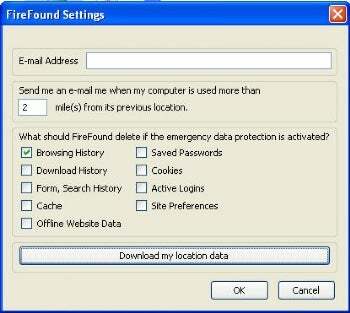 From then on, you can log in to your FireFound account from any computer and check the FireFound-enabled browser's location history. If your computer is lost or stolen, you can also activate an "emergency data protection" feature that will prompt anyone who next starts the FireFound-enabled browser for the username and password. A failed FireFound login will clear out your private Firefox data, such as passwords, browing history and cookies. You have to first choose what will be deleted when you enable the emergency feature. Since the option will delete your data, you should of course be careful to only enable it if your computer is actually lost or stolen. Successfully entering the username and password will turn off the feature, but you (or whoever has your laptop) will only get one chance. Type carefully. Also, although you can install FireFound on multiple browsers, it doesn't separate which location data comes from which browser. If you turn on the emergency data protection, the first browser that fires up (and only that browser) will get the password challenge. Despite its limitations, FireFound is a nice tool that can be of serious benefit if you want to keep your private browsing information out of the hands of a laptop thief. The add-on won a grand prize in Mozilla's Extend Firefox 3.5 contest.